The infamous Tokyo Yamanote Halloween Train rode yet once more this year despite fears of police crackdowns and potential violence from frustrated Internet nerds. 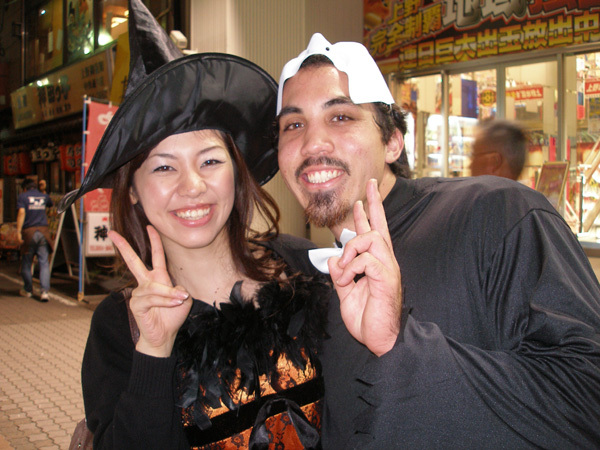 The Tokyo Yamanote Halloween Train is an unofficial semi-traditional event going back over 20 years where foreigners and Japanese in costume party on the Yamanote Train Line which loops through Tokyo. Now, I've ridden this notorious public transportation menace a fair few times (four times as of now), and I must say this time was as nerve-wracking as it was exhilarating. Each time I've ridden the Halloween Train, it's been fun but this time things were a bit more tense than before. Looming over the party atmosphere was the specter of the Akihabara murder-spree this past summer where a deranged man killed seven people with his vehicle and knife. Prior to doing so, he had posted on the Internet that he would do so. Akihabara is a mecca for the anime otaku or Japanese animation nerd. Otaku (nerds/geeks/dorks) are the pariah of Japan. They have been scapegoated for social ills sometimes unfairly and sometimes not. Many are just harmless individuals who just like anime and manga while indulging in a bit of cosplay now and then. These types lack the anger and alienation of other otaku whose behavior rather than their particular obsession sets them apart. The killer Kato Tomohiro is seen as one of these types who finally gave into his dark twisted inner nature. Our gathering was small for several reasons. One, there was little advance warning; two, it was rather early for Halloween being the 25th; three, there was worry the police would shut it down and arrest participants; and four, there was fear of violence from 2channel people. 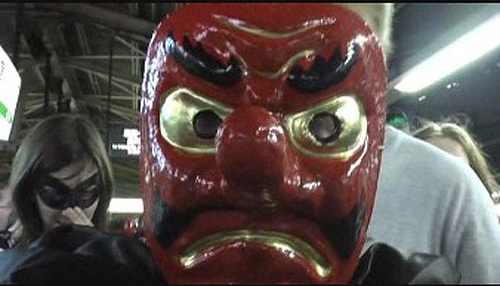 2channel or Nichannel/Nichan is a Japanese Internet community that is known for its outspoken members. Because of its complete anonymous nature, it attracts a certain number of individuals who slander and defame businesses, political figures, and celebrities. These individuals are often described as extremely conservative, angry, xenophobic, vindictive, and incapable of functioning in the real world. In 2007 when certain 2channel members learned about the Halloween Train event, they saw red and plastered websites which mentioned the event with obscenities and violent threats. Japanprobe was hit especially hard as someone had posted an invite there to the Halloween Train and 2chan people assumed Japanprobe was sponsoring the event. Two commentators stood out at the time - one who threaten to blow away the trains and one who said he would go there with a knife. After the Akihabara tragedy, such threats are no longer passed off as empty threats made by Internet nerds who never leave their computer. There is a dark side to the otaku culture of frustrated young men angry at society, with their lives, and with their lack of human contact. Generally lashing out through their online personas is enough for many of them but for some it hasn't and what Japan may experience is more Internet-fueled rages in the real world. We can't reach our Beer! The Halloween Train was packed with police most of them undercover while at the major stations a dozen uniformed police stood waiting. Some of us began to worry our night of merry mayhem would end in a Japanese jail cell and possible deportation. As it turns out, the police were less there because of us but more there because of the potential threat the 2channel users posed. Due to their hatred for the Halloween Train event some 2channel members actually made the ultimate sacrifice of prying themselves away from their cyber fantasy worlds and entering the cold harsh realm called the real world. They came to our event but they certainly weren't there to partake in the festivities. One of them tried to make off my bottle of Campari when I offered to him in a gesture of good will. I had to wrestle it out of his hand to get it back. The 2channel members were easy to spot as while other passengers just ignored the event going on around them, the 2channel people defiantly ignored the event going on around them. Some of them though harassed Japanese participants of the Halloween Train questioning their love of their home country and other nationalistic jingoism. 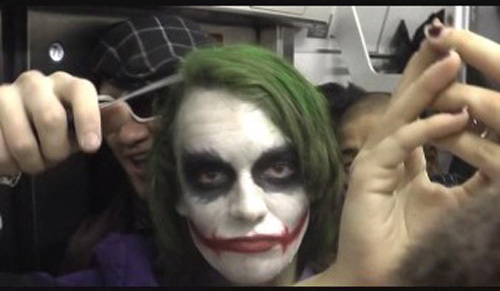 Heath Ledger's Joker is a frightening psychotic character and we had a Joker on our train complete with knife (fake). 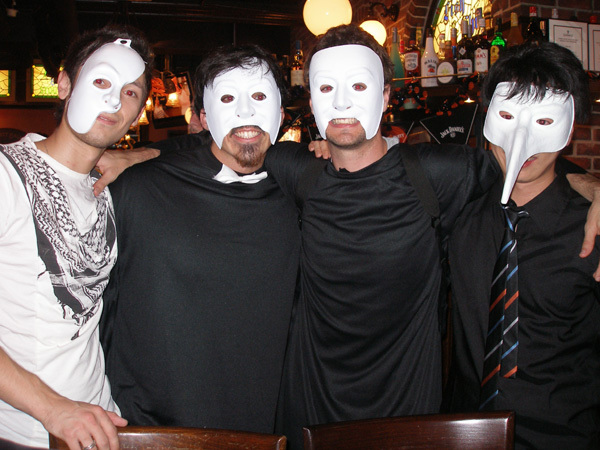 However, one regular-looking 2channel member proved to be far more frightening than our lovable clown-face psycho. When asked by a Halloween Train participant if he liked peace, he replied that he liked war and that he wanted to kill the participant. 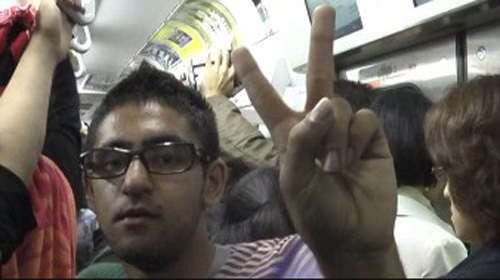 Immediately, in this packed train, that 2channel fellow found ample space around him as people recoiled in horror. Flashes of Akihabara went through many minds and through it all the placid expression on his face did not change - all the more frightening. An undercover policeman inquired about the incident and let it be known that they were more here to protect the party participants from the 2channel members. This may strike one as strange that the police would willingly protect an event what some have condemned as hooliganism and even terrorism but one has to understand that this event has been going on for well over 20 years. It happens once a year (usually) and in recent times lasts only an hour or so. The worse that happens is some lights are turned off and some people get on the luggage rack. Hey, Mom! I'm on the Tokyo Yamanote Halloween Train! On the other side of the equation we have this subculture of embittered socially-awkward young men with chips on their shoulders who after the Akihabara incident are capable of doing far worse than turn off a few lights. 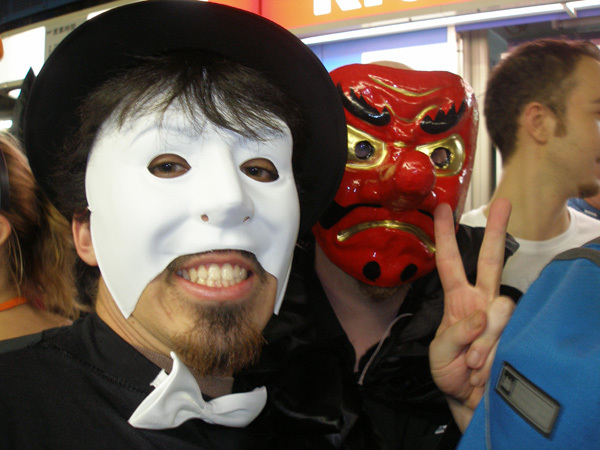 Reportedly in 2007 after the Halloween Train event which started in Shinjuku and had police and otaku alike some party participants were beaten afterwards. As for the Halloween Train, it was a bit more low key than previous ones but we did our usual station chanting. Hamamatsucho Station, however, defeated our best efforts. It's hard getting a group of inebriates to chant multi-syllabic words. We ran into a slight snag at Osaki station. Although the Yamanote Line loops around Tokyo, not all its trains do. Some stop in Osaki and are switched out. We happened to be on one such train though we didn't know it. 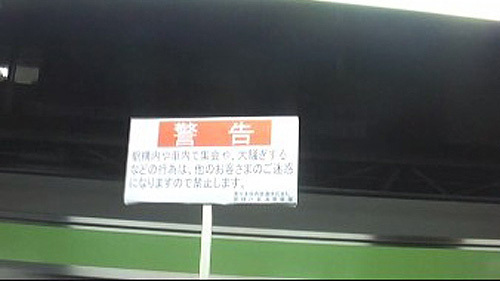 We thought at first they were shutting down the train like they did with the Shinjuku Halloween Train last year. Fortunately, it was a routine shutdown. We simply crossed over to the other side and grabbed another train going the same direction. Half of the group went over to the other platform and took a train in the direction we had just came no doubt surprising the police at the stations we had already left. Once again two Halloween Trains were on the loose and chaos reigned. Another amusing note to the evening was the presence of a vocal foreign critic to our soiree. Buried beneath the press of passengers, photographers, and nerds, was our moral compass. Periodically we would hear over the din, the shrill nasally cry of "you shouldn't be drinking on the train!" and "you shouldn't be shouting!" even though he himself was shouting. I'm not sure what he got out of it but if it made him happy, good for him. Our train party decided to exit at Ueno despite originally stating we would do so at Ikebukuro. This was to throw off any unwanted welcoming parties that might been waiting for us in the shadows outside the station. We received a celebrity sendoff by a mob of photographers. They formed a semi-circle and snapped away like we were rock stars. With the police protection, stalkers, and photographers and our larger-than-life behavior we kind of were rock stars. 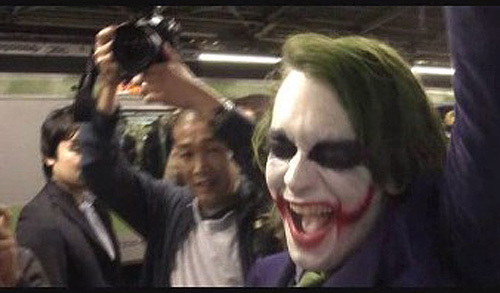 Yamanote Halloween Train Paparazzi - "No Autographs!" We finally got out of the station after having hundreds of photos taken of us by reporters and passerbys and celebrated out success (and survival) over a few cold ones. Scarily enough, we still had a few 2channel members tailing us. Two undercover cops were there though to make sure they didn't try anything. 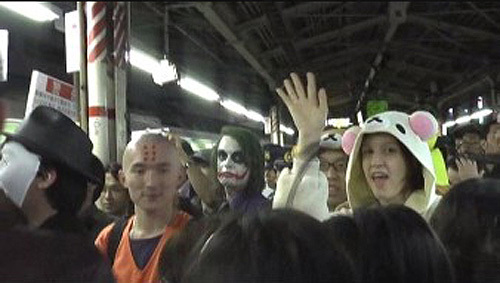 So another successful and highly interesting Yamanote Halloween Train went down in the annals of Tokyo lore. I cannot say truthfully if this was the proverbial "the" Tokyo Yamanote Halloween Train as another may still run in the near future but I can say this was definitely "A" Tokyo Yamanote Halloween Train and I was glad not to have missed it.